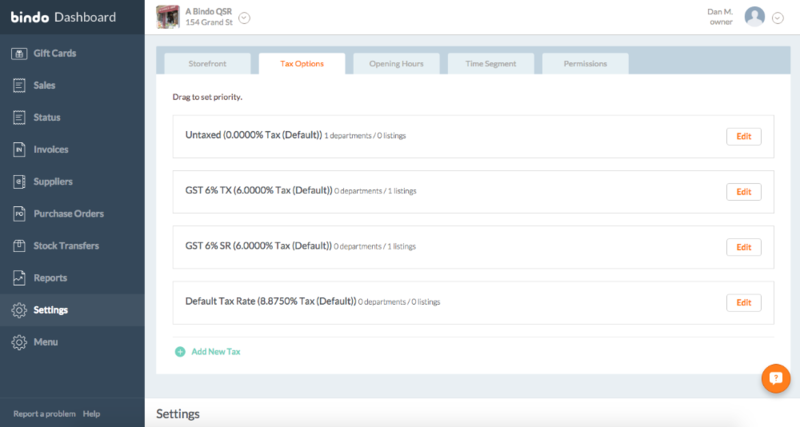 In Bindo version 3.3 and later create tax rates on the Bindo Dashboard under Settings > Tax Options. For a simple tax just enter the "Tax Name" and the "Tax Rate" (number only). Leave the "Tax Type" set as "Tax (Default)" and the "Threshold or Exemption" as "Normal (Default)". You may leave the "Priority" and "Threshold amount" fields blank for a simple tax. Click Save to save the new tax rate. Once created, a tax rate will apply only if you do one of the following: set that tax rate as the default tax, associate that tax with a specific department, or associate that tax rate with a specific product. When you first create a store in Bindo there is a tax rate already set up, and that tax rate is automatically configured as the Default Tax Rate. View this article on Associating Tax Rates with Products to learn more about making different tax rates apply to different items.